Easy access to interstates and Ohio State University La Quinta Inn Columbus Airport Reynoldsburg is an affordable comfortable option for our guests. This 122-room hotel on two floors provides rooms with free Wi-Fi flat-panel cable HDTVs coffeemakers and plenty of space to stretch out and get comfortable. Some rooms and larger suites have microwaves and mini-fridges and non-smoking rooms can be requested. The hotel's free expanded continental breakfast includes hot and cold items such as waffles cereals fruits juices and coffee and tea. Business facilities such as copy and fax machines are available. When you get some downtime head for the seasonal outdoor pool. The hotel provides free passes to an off-site gym. Parking is free and pets are allowed for an extra fee. 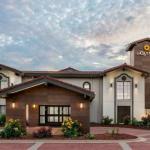 La Quinta Inn is nine miles from Port Columbus International Airport and 12 miles from Rickenbacker International. Ohio State University is 20 minutes away as is the Columbus Convention Center. The Ohio Expo Center and Fairgrounds can be reached in 15 minutes. Dogs up to 20 pounds are allowed. There are no additional pet fees. Dogs may not be left unattended, and they must be leashed and cleaned up after.